Now that we’re well into October we should feel a coolness in the air. This being Norfolk, though, we may end up waiting a while, but despite current temperatures, we know fall is here. We can always tell when the seasons change because we see an uptick in activity at our Norfolk self-storage facility. This is the time to put away spring and summer clothes to exchange them for coats and jackets and other warm attire. Before you bring over all your shorts and tank tops to sit through the winter, though, you want to be sure everything is properly packed. 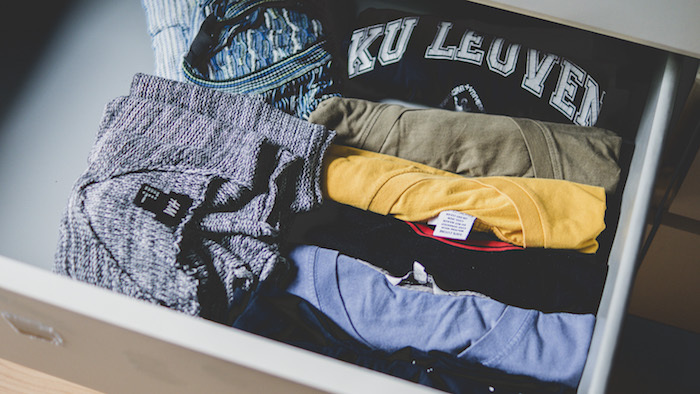 Whether you intend to store one box or several of unnecessary clothing, it’s important that everything is laundered and fresh. Even one unclean pair of pants can spoil a box of clothing set for storage, because over time what bacteria and stench remains can spread. You may find it difficult to get a bad smell out of all the clothes in that one box. Make sure all the pockets are emptied, then wash and completely dry every article of clothing bound for your unit. When packing clothes for long-term storage, we recommend using plastic containers with lids that seal. Cardboard boxes are good to use for certain items, but sealed plastic (especially see-through since it helps you keep track of things) receptacles are better for delicate items. They help reduce the risk of mold, mildew, and mites in your clothing, and an airtight environment can help preserve your clothing so everything is wearable right out of the box in spring. Some people may “double-up” on packing – that is, placing clothes in plastic bags before adding to a container. While it’s not a bad idea, it’s important to note that tight bags, especially if they are vacuum-sealed, could misshape some of your clothes if left for long periods of time. Take it into consideration before you decide. Lastly, regardless of the type of container you use, you want to add some kind of moth repellant. The term alone evokes thoughts of smelly mothballs that turn your clothes stale, but certain aromatic herbs can be used for the same purpose. Any combination of lavender, rosemary, mint, thyme, and bay collected in a sachet bag will work. What about dryer sheets, you might wonder. We understand adding a dryer sheet to your clothing may repel some bugs and mites, but they may not be 100% reliable. If you want to add one in each box to maintain a fresh scent for your clothing it shouldn’t do harm, but research your options in order to protect your belongings. If you have a storage unit with us, we’ll see you soon for the clothing exchange. If not, are you’re interested in fall and winter storage, contact us today.